There have been times when I’ve felt I’m looking at the last Sage-grouse in the world. The image above was one of those times. Fortunately, these bleak scenes are offset by moments of restrained joy when witnessing thirty or forty male Sage-grouse strutting for a few females. I’ve been reading all of the rhetoric I can get my hands on since the CR-Omnibus rider prohibiting the USFWS from pursuing any ESA activities related to Greater Sage-grouse listing while blocking the recent “Threatened” ESA designation for the 4,000 or so Gunnison Sage-grouse that remain. I’ve been doing this work long enough to understand that these decisions generally have nothing to do with the affected species, but this decision is stunning on a number of levels. The media seems content to trot out the tired energy vs: “environmentalists” angle to many stories, describing Sage-grouse as “brownish, chicken-sized birds that live in sagebrush.” Further complicating the chaotic picture, Colorado Governor Hickenlooper has sued the Obama administration over the Gunnison Sage-grouse “Threatened” status “because the Gunnison Basin population, which comprises the vast majority of the species’ individuals and occupied range, is not in danger of extinction now or in the foreseeable future.” We can debate that – a drought year(s) or fire could wipe out many in a population that exists in one location – all the eggs are in one basket. But it doesn’t matter because the discussion has moved away from the welfare of two imperiled species – and how we can work together for their recovery – to bureaucrats pushing ideology over science. There’s no science in the CR-omnibus rider. 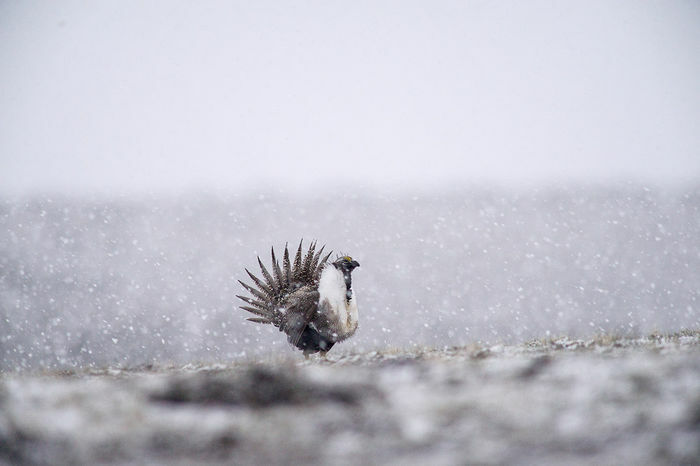 If you’re new to the issue, you need to know this: Westerners are working together and finding common ground, and Sage-grouse are imperiled. Brian Rutledge VP and Policy Director for the National Audubon Society, who’s been leading Sage-grouse conservation efforts for over a decade said this: “The priority right now is to get science-based, state-level conservation plans in place that are effective enough to avoid a federal listing for the Greater Sage-Grouse in the first place. This rider will only complicate coordination between the BLM and statehouses and stems entirely from political maneuvering, ignoring scientific input and voices across the Mountain West that want strong plans in place.” Science-based. Avoid a listing. Work together. Interior Secretary Sally Jewell said her department will continue to act “with urgency” to preserve Western sagebrush landscapes and will reach “a decision” this fiscal year on whether to list the sage grouse under the Endangered Species Act, in spite of a legislative rider Congress passed as part of its 2015 spending bill that blocks formal listing actions. Posted in Politics, Sagebrush Sea on December 17, 2014 December 17, 2014 by Dave Showalter.